At California Virtual Academies, our students are exempt from the Vaccine Law SB277. Hear from students, parents and teachers about why the 9 independent California Virtual Academies works so well. You know that your kids have something special inside them. We know it, too. The nine independent California Virtual Academies and K12 ignite the minds of children like yours to bring learning and innate possibility alive. Together, we are helping California students in grades K–12 reach their true, personal potential. Learn more about the 10 independent California Virtual Academies. 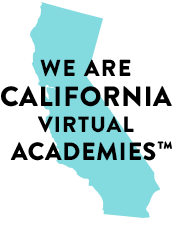 The nine independent California Virtual Academies are fully accredited by the Accrediting Commission for Schools of the Western Association of Schools and Colleges. The California Virtual Academies comprise nine independent public charter schools: CAVA@Fresno, CAVA@Kings, CAVA@Los Angeles, CAVA@Maricopa, CAVA@San Diego, CAVA@San Joaquin, CAVA@San Mateo, CAVA@Sonoma, and CAVA@Sutter. This public school option may not be available in all counties. 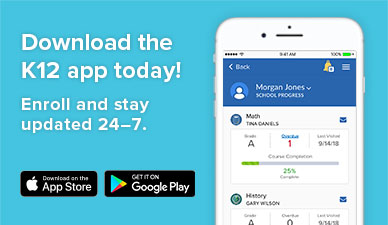 Copyright © 2019 California Virtual Academies. All rights reserved.